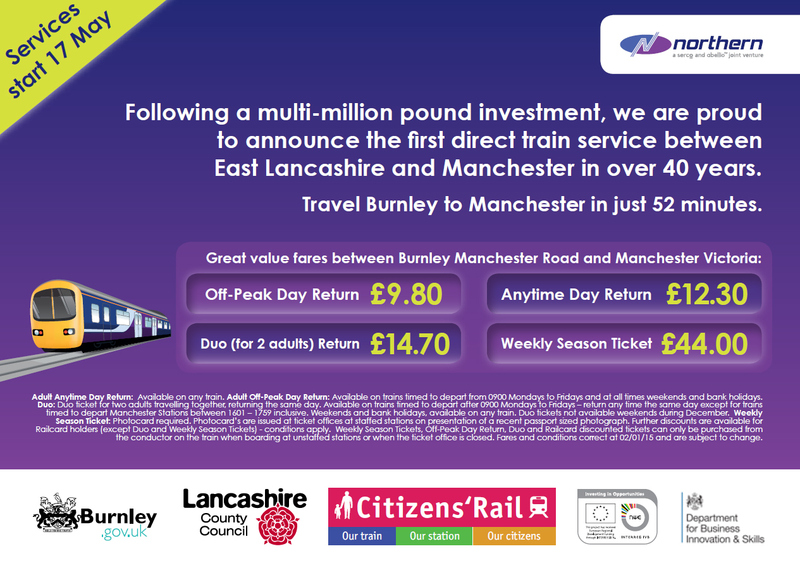 The countdown to the launch of the first direct rail service between Burnley and Manchester in over 40 years has begun. For 17th May, passengers will be able to depart from Burnley Manchester Road station, transformed as part of the Citizens’ Rail project, and reach Manchester Victoria in just 52 minutes. The service is made possible by the reinstatement of 500 metres of rail track known as the Todmorden Curve. This is the result of a multi-million pound investment and almost a decade of partnership work between Burnley Council, Network Rail, Lancashire County Council and Northern Rail. Advanced marketing of the new service has now started, with 90,000 flyers (shown below) distributed to households in the area, and the launch of a dedicated webpage. This will be followed by an extensive marketing campaign, coupled with a celebration morning at Burnley Manchester Road station on the first day of the new service.